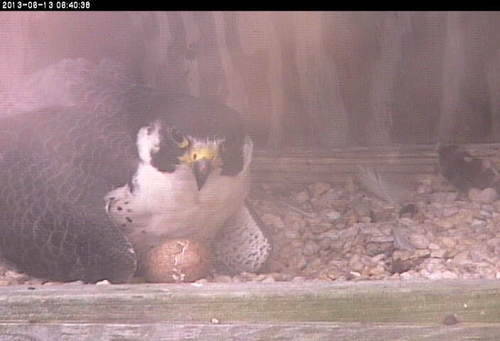 This morning just before 7 am, another of the eggs has hatched. 1.) A pip or initial hole can clearly be seen in this photo. This is the chick’s first effort to break through the shell using its egg tooth (a small knob on the end of their bill that will fall off shortly after hatching). 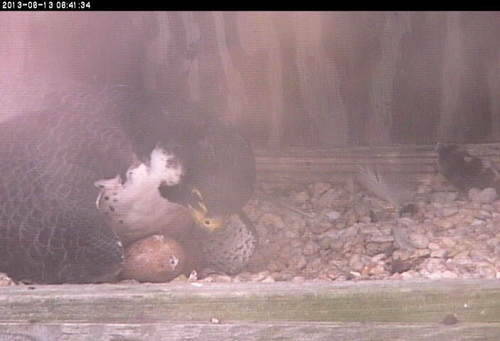 The chick has broken through the air space at the end of the egg and in now breathing outside air. From here the hard work really starts. This is a long and demanding process for the tiny chick and may take up to 72 hours to complete. 2.) 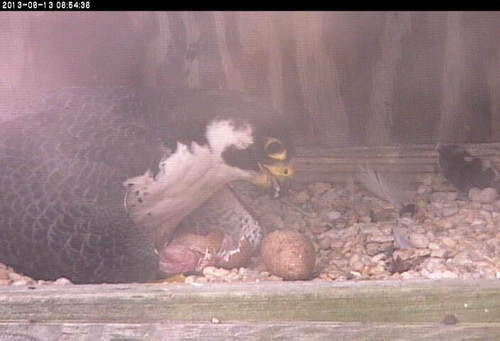 The chick will now rotate inside the egg scratching and scoring the inside of the shell as it goes. A muscle in the chick’s neck (the complexus muscle – also known as the hatching muscle) becomes enlarged just prior to hatching. Using this muscle the chick will push against the shell to try to break the two halves of the eggshell apart. Here you can clearly see the line the chick has made around the circumference of the egg. 3.) Once the eggshell has been weakened enough the chick breaks free! Initially they are still very wet and exhausted from this very demanding ordeal. Prior to hatching the chick will have absorbed any remaining yolk in the egg for energy. Soon the chick will dry out and we’ll see the fluffy white down that covers it.